UNPACKING THE SHIP’S BELL CLOCK AFTER SHIPPING. Take clock and key carefully out of the carton and place the key aside. Remove any soft foam directly behind the round cover (if any). Replace the plastic access cover. Please wind your clock fully every 7 days for optimum performance. 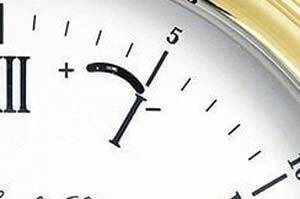 To wind, the clock uses the enclosed key. The right winder is for the time, and the left one is for the striking. Never turn the hour (short) hand as it turns automatically. REGULATING THE TIME ON THE CLOCKThis clock will keep time to within about 2 – 4 minutes per week. 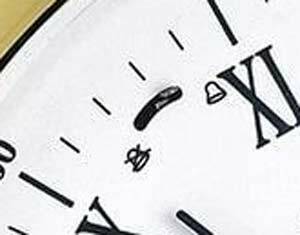 To regulate the clock: Use the lever with the + and – symbols on the upper right side of the dial. Move it to + to speed it up, and towards – to slow it down. make only a very small adjustment each time, and then set the clock and test it for several days. The striking may be turned off by moving the lever on the upper left side of the dial to the “no bell” position. 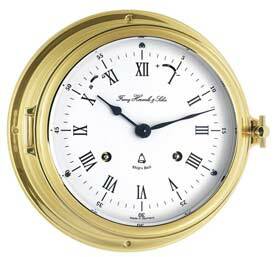 The Ships bell strike is based on the “watches” onboard ship of 4 hours each. A new watch starts at noon, 4 p.m., 8 p.m., midnight, 4 a.m. and 8 a.m. The end of a “watch” and start of a new watch is marked by the bell being struck 8 times. A half-hour later, the bell is struck once, with an additional strike each half hour until the end of the watch. Then the cycle starts again. The bells are struck in pairs, that is, the first two bells are struck close together followed by a pause, then the next two, etc. The table below shows the pattern of the bells.